A YouTube vlogger says he recently woke up in his New York City apartment to find two strange men holding a knife to his throat and was robbed of thousands of dollars in designer goods. 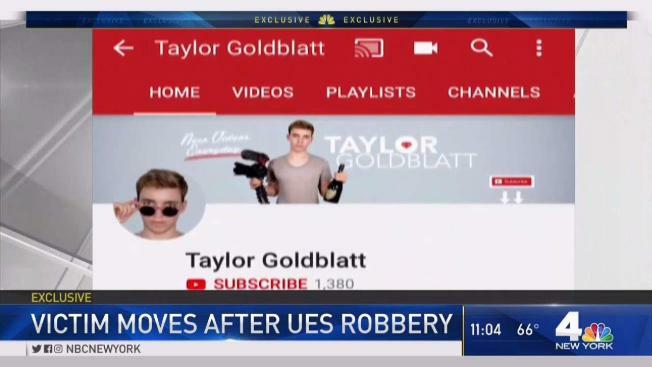 Taylor Goldblatt, 24, said the burglars crawled up a fire escape and pushed open a window into his Upper East Side apartment and robbed him at knifepoint. The incident happened about 3:30 a.m. on April 15, according to police. Goldblatt believes he was targeted because of his online presence, where he talks about expensive clothing brands. "They said, 'You should really stop putting videos like that on YouTube,' and they started calling me Tay Money, which is the name I use on YouTube," he said. His YouTube bio states: "My name is Taylor. I'm a rich kid, spendthrift and money is my middle name. I spend the majority of my time living a lux life of opulence in the Upper East Side of New York City. I am a blogger and social media creative, with an avid love for menswear and all things fine luxury." Goldblatt admitted, "I had a video that said, 'My $35,000 Gucci collection.'" And that's what police said the thieves took: clothing, bags and shoes, some of which Goldblatt showed on social media. Police said the two men fled on foot, and surveillance video shows the alleged robbers running out with designer bags. Goldblatt said they took about $50,000 worth of designer goods. "It was weird, they were conversing in front of me, like, 'Should I take this?'" he said. "They were speaking in Spanish, so I didn't know a lot of what they were saying." "At the very end, they shook my hand, and that really freaked me out." After scaring him, robbing him and then thanking him, the thieves are seen gleefully walking the streets of the Upper East Side. Goldblatt left the city immediately. "I was terrified. I wanted nothing to do with New York, so I quit my job the next day," he said. "I booked the first flight I could get on." Goldblatt went home to his family.